Life sometimes takes us through some tough times and it’s hard to understand why. I have finally figured out MY why. I had an “ah-ha” moment in 2017 after completing treatment for breast cancer. As I spent time talking to groups of women who had gone through their own cancer experiences, I noticed that there were certain gifts that really helped these amazing women through THEIR cancer journey. Some gifts were just more meaningful or useful. Until you have gone through it, of course you have no idea what would be helpful or make such a difficult time a little bit easier. That is when I realized how I could help! I had been creating for many years. It was clear to me that I needed to use my experience to make the gifts that could help friends and family members express their support in a truly meaningful way. Time to Rally was born. Now that I know what my purpose is, my days are spent helping YOU help YOUR loved one through their difficult time. This is a photo of me in a Dragon Boat. I am part of a group of local breast cancer survivors who have formed a competitive racing team. We use paddling as a fitness/health goal. We participate in races at festivals and have an incredible sisterhood. We are so excited that everyone that gives our merchandise as a gift knows that they are getting authentic Time to Rally handmade products worthy of becoming a keepsake for their loved one. 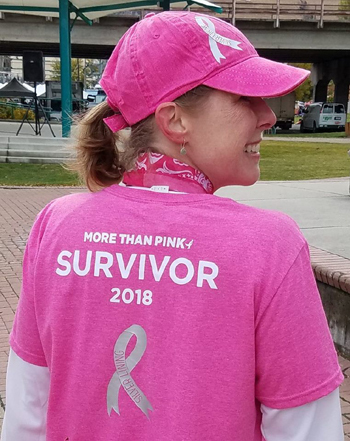 Race for the Cure, 2018. After all the dragon boat training, I was able to run a 5K!